Spanning the entire history of the park, from its founding more than 50 years ago to the present, this fascinating book explores 500 attractions, restaurants, stores, events, and significant people from Disneyland. Each of the main encyclopedia entries illuminates the history of a Disneyland landmark, revealing the initial planning strategies for the park’s iconic attractions and detailing how they evolved over the decades. Enriching this unique A-to-Z chronicle are profiles of the personalities who imagined and engineered the kingdom known as The Happiest Place on Earth.” Discover unbuilt concepts, including Liberty Street, Rock Candy Mountain, and Chinatown, and delight in fascinating trivia about long-lost Disneyland features, from the real rifles in the shooting gallery that used to be located on Main Street to the jet-packed Rocket Man who flew above Tomorrowland. 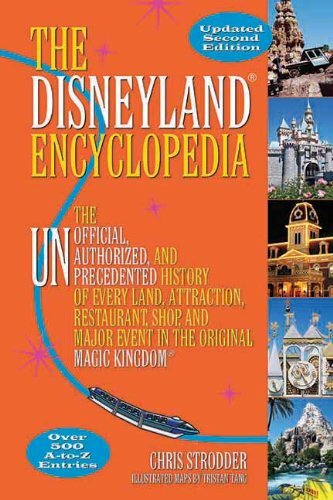 Overflowing with meticulously researched details and written in a spirited, accessible style, The Disneyland Encyclopedia is a comprehensive and entertaining exploration of the most-influential, most-renovated, and most-loved theme park in the world!